Late fall, when the heaters turn on and the skies turn gusty and gray, is the start of dinner party season for me. The days of strolling around and sitting down in the park for an impromptu picnic are done for the year. The air conditioners have been deposited to their upper reaches of closets. It’s cozy indoors, and even when you pack a table with twelve guests and blow steam from the stove all day, it’s still not too hot inside to eat plenty. So I made two lasagnas for this party, one with artichokes, Swiss chard and ricotta smothered in a creamy bechamel sauce. It was the ying to the yang of the second lasagna, this homage to the deli-staple Italian subs I’d grown up with in New Jersey. There is no fixed formula for an “Italian sub,” but it’s Italian-American through and through. 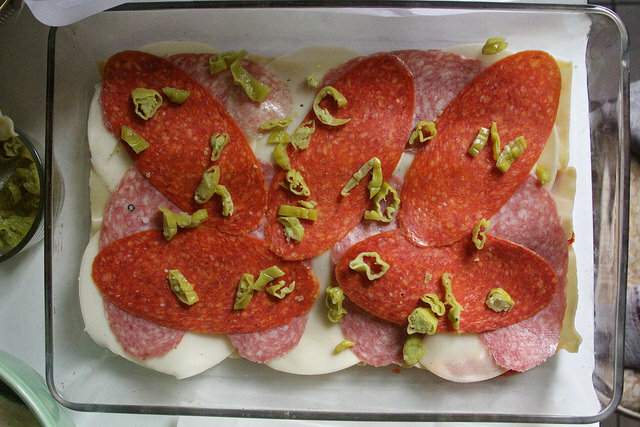 It’s got slices of deli meats, usually including salami and pepperoni, sometimes capicola, too. Cheese, usually sliced provolone. Lettuce and tomato are optional, but it must be greasy and wet with oil and vinegar, often studded with a dried oregano and herb mixture like Italian dressing. And if you’re not faint of heat, you should add piquant pickled peppers like pepperoncini. This is all layered inside a long submarine sandwich roll. So why not layer it with sheets of pasta and bake it, too? It’s a supremely tasty combination, and adding some more fat and flavor in the form of ricotta, mozzarella and tomato sauce brings it to bone-sticking levels of winter satisfaction. (And sort of merges it with its submarine sandwich rival, the meatball sub.) Vegetable salads and sides were placed out so people could graze on as much or as little of these rich main courses as they liked. But eat plenty most people did. I barely had to scrape the casserole dishes once the night was over. 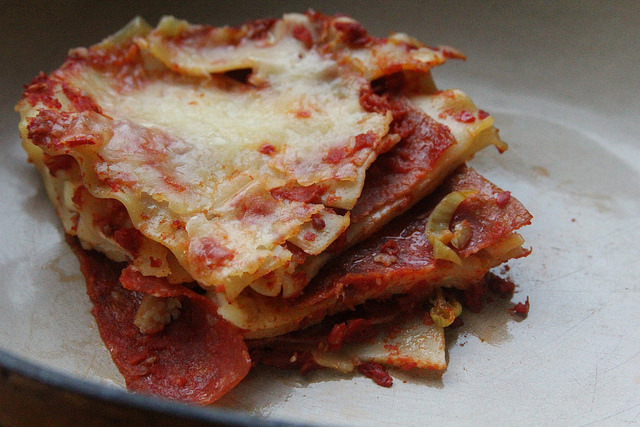 So make a lasagna this winter—with any favorite food as your inspiration. It’s a bit of work but it pays off with its plenty. You will happily eat leftovers the rest of the week if you don’t throw a party (lasagnas always hold together nicely as leftovers). And it’s adaptable to your whims, or childhood memories. I didn’t actually like lasagna as a kid—which is totally strange, I know—so making it as an adult is something of a novelty. But no matter how many times you’ve eaten a certain type of dish, whether it be meatballs or lasagna, chicken soup or tacos, there are always ways to make it new, exciting, and maybe a riff on some other type of food you like, too. And being around plenty of people to help eat it up and share in that discovery makes it that much more memorable. OR skip the dough part and use a box of lasagna pasta; cook to instructions on package. 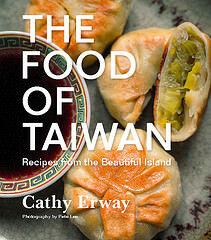 If making the dough from scratch, place the flour in a bowl and form a well in the center. Break the eggs into the well, and begin beating them with a fork at the bottom of the bowl. Let the sides of the flour well gradually mix into the well, slowly, as you continue to beat them with a fork. Once most of the flour has been incorporated, ball up all the dough and turn onto a well-floured cutting board. Knead the dough ball, adding more flour as necessary to keep from sticking, for 10 minutes, or until the ball of dough is smooth and elastic. Cover with plastic wrap and let rest and chill for at least 30 minutes. Then, use a pasta crank to create thin sheets. You may want to cut each sheet in half after rolling out to create two halves that will be layered together horizontally in your casserole dish. 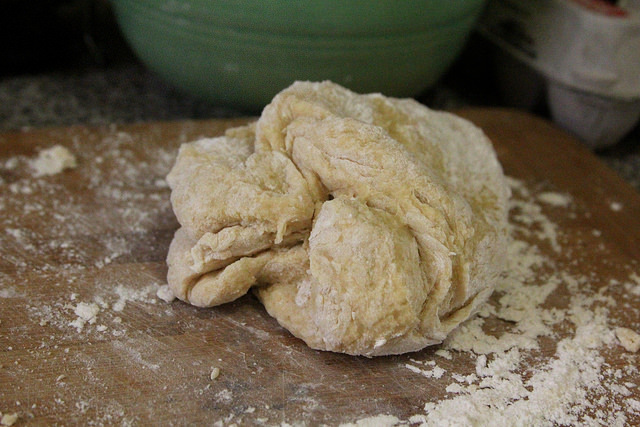 If using fresh dough, there is no need to boil first. If using store-bought pasta sheets, boil according to instructions on package and drain. 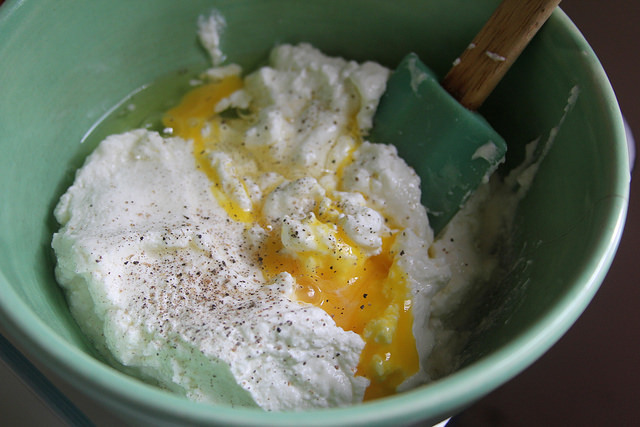 Mix the ricotta with the egg and a generous pinch of salt and pepper. Preheat oven to 375 degrees. Spread a small ladle of tomato sauce on the bottom of a 9 x 11″ casserole dish. Add one layer of pasta sheets. Arrange a layer of provolone, salami, pepperoni and pepperoncini across the top, along with another small ladle of sauce. Top with another layer of pasta. Spread about 1/3 of the ricotta mixture evenly across the top. Top it with another layer of pasta. Repeat these layers until you run out of ingredients. 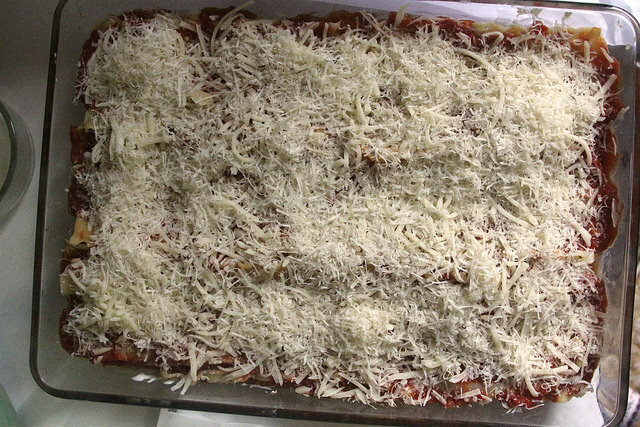 Spread the final top of the pasta sheets with sauce, followed by the grated mozzarella and parmiggiano-reggiano and the dried oregano. Cover the casserole tightly with foil and bake for about 30 minutes. Remove the cover and continue baking another 10 minutes or until the top is slightly crisp. Let cool for at least 5 minutes before serving. Eight brownie points: No, this is not a diet-friendly dish. But if you’re going to indulge in lasagna, a homemade one is the best way to control what you’re getting—even if you’ve determined that it will be loaded with carbs and fats. Italian subs aren’t exactly the healthiest food inspiration, but a little bit of tasty meats goes a long way in adding flavor. That’s why I didn’t really load on too much of the cold cuts. Since it’s already coddled in cheeses in tomato sauce, you don’t really need much to satisfy. 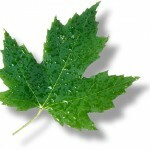 Four maple leaves: Another low point here. But again, small amounts of flavorful meat to stretch across one hearty main dish is a good way to keep your meat consumption relatively light while enjoying a dish to its fullest. You can often find fresh ricotta from local dairy farms made without the preservatives in many mass-produced brands, and you’ll taste the difference. Finally, by making your own pasta out of simply flour and egg is a good way to cut down on all the bulk of packaged stuff, although it is a bit of work. It is hardly to find people who doesn’t love italian food. I’m sorry, but did you just say Italian Sub LASAGNA? What kind of magical sorcery recipe is this? The hubs loves lasagna so I can’t wait to surprise him with this recipe! Pinning for later!